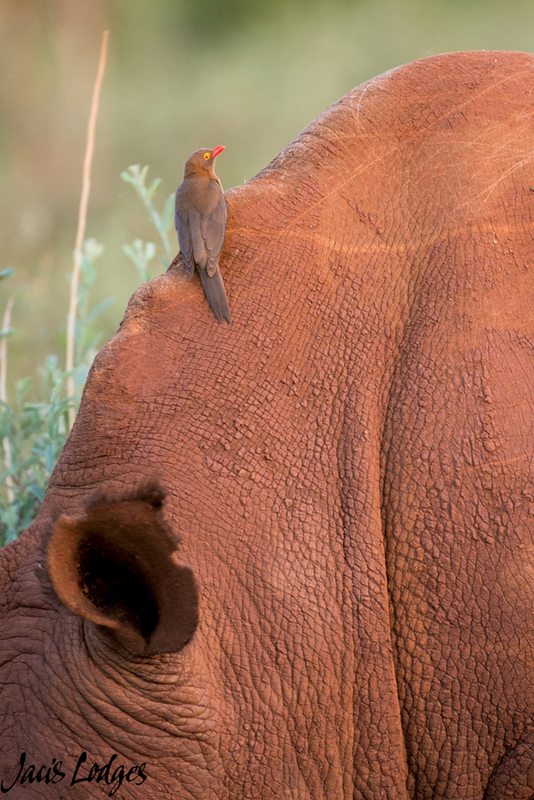 We recently hosted a very keen photographer at the lodge, and Darren Donovan was their guide. Darren kept a diary of the sightings and compiled the below sightings blog. We started out hanging around the area, just to the west of the lodge. 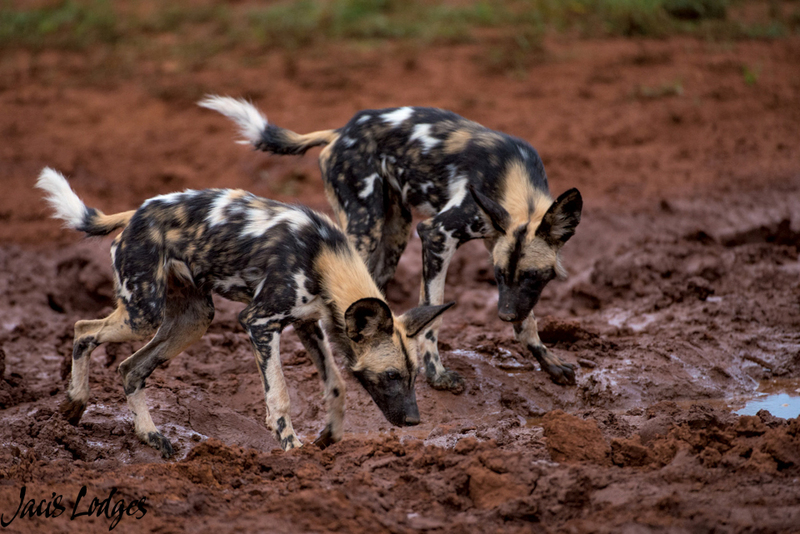 The plan was to hopefully get African Wild dogs, as a pack was seen in the area during the morning drive. Initially we got a White Rhino bull, but unfortunately the weather wasn’t playing along and to be honest the light wasn’t great at all. But we were here to take photos, so a slightly more technical approach was needed to get the best out of the cameras. We then continued to the west. Then the African Wild dogs were found, to the north of where we were. We slowly started making our way to the area, watching a vast amount of Zebra, Giraffe and Wildebeest as we puttered along. We got to the Wild dogs when they were on the move, the combination of moving subjects and iffy light made it even more difficult. We had to wait for them to stop, and then we’d be able to get the shots. 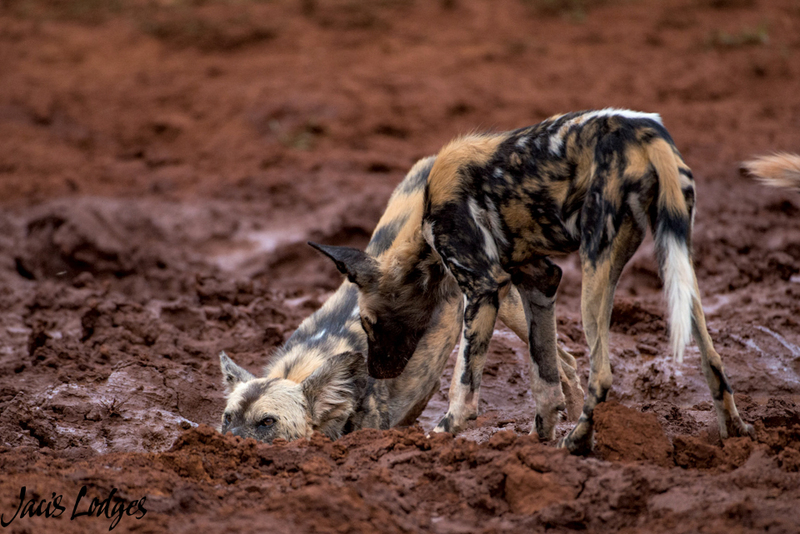 A little while later, and some pretty serious off-road driving and the Wild dogs stopped for a drink at a seasonal water hole. This was our moment! We managed about 2 minutes of photography, before the Wild dogs sped off even further to the north. 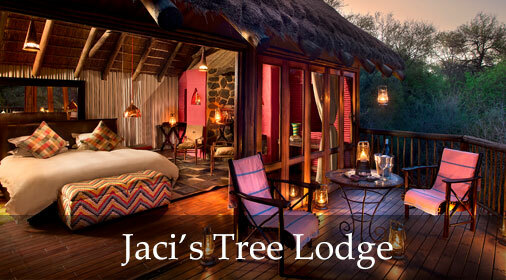 Not a bad start to the 3 day photographic safari. The next morning, we got going at 5am. 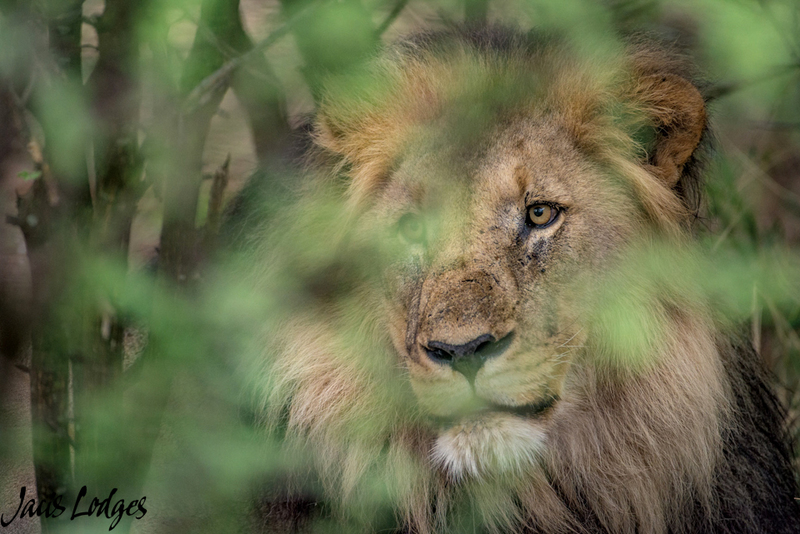 The plan was to head to the far north, to look for a pride of Lions and 2 males that were seen in the far north the previous afternoon. 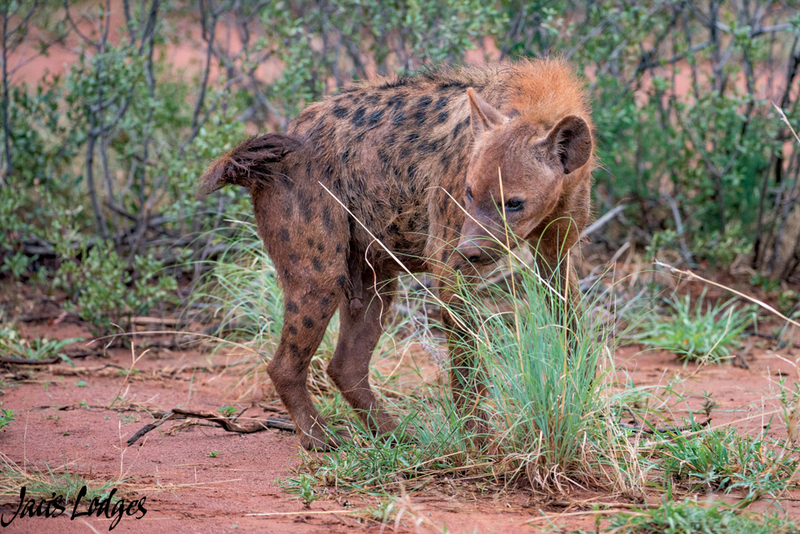 We started off with a clan of 7 Spotted Hyena’s just to the north of the lodge. As we went further north, we encountered numerous plains game sightings of Wildebeest, Giraffe, Zebra and of course Impala. By then the Lions had been found and we puttered to the area. A lone Elephant Bull, gave us a good mock charge, just ensuring we were all awake. Then we got to the Lions! 3 females and a single male, lying in a thicket. Typical Lions, but we managed a couple of interesting shots before we started our way back to the lodge. 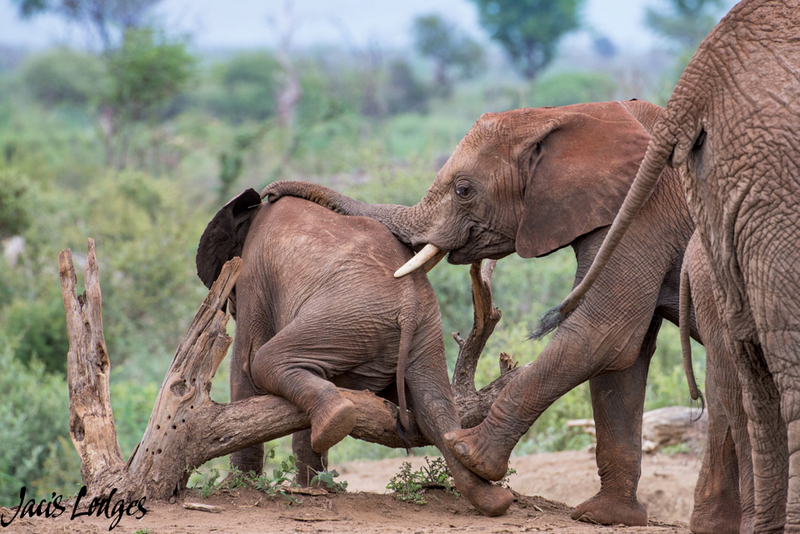 We saw another herd of Elephants, and en joyed photographing the antics of the youngsters, before the herd moved into thicker bush. For the first time, we had some sunshine and we were desperate to get some good shots with good light. There was another Lions pride, but this time with 3 male Lions seen in the central part of the reserve and 2 male Cheetahs in the south. This was the plan! 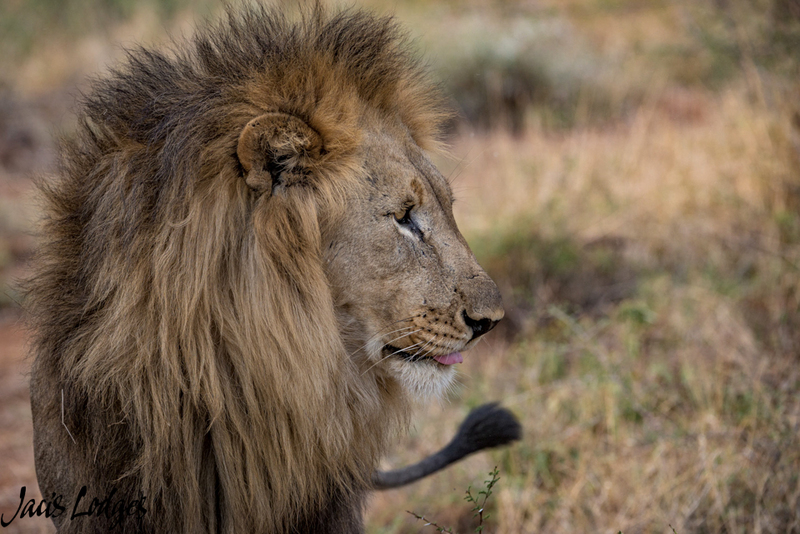 We found the Lions without any trouble, and took advantage of some good light, before moving south for the Cheetahs. 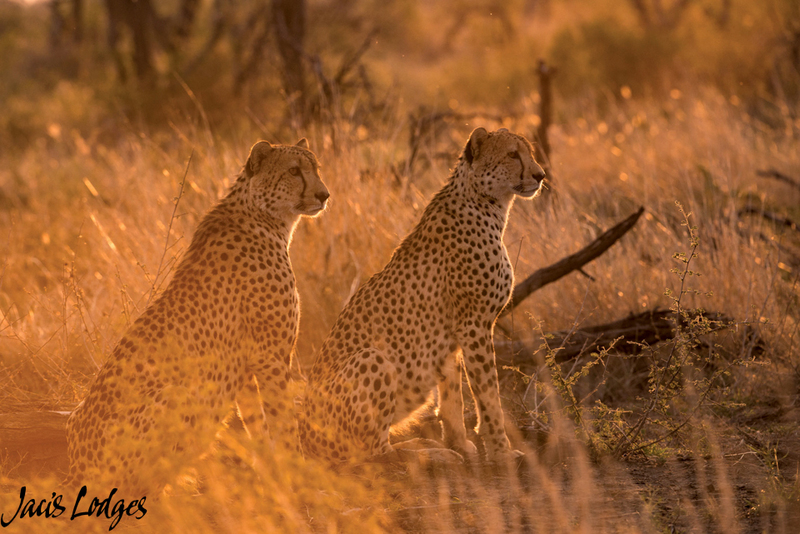 I wanted to get to the Cheetahs in the golden hour period, so I spent some time on the other interesting creatures. 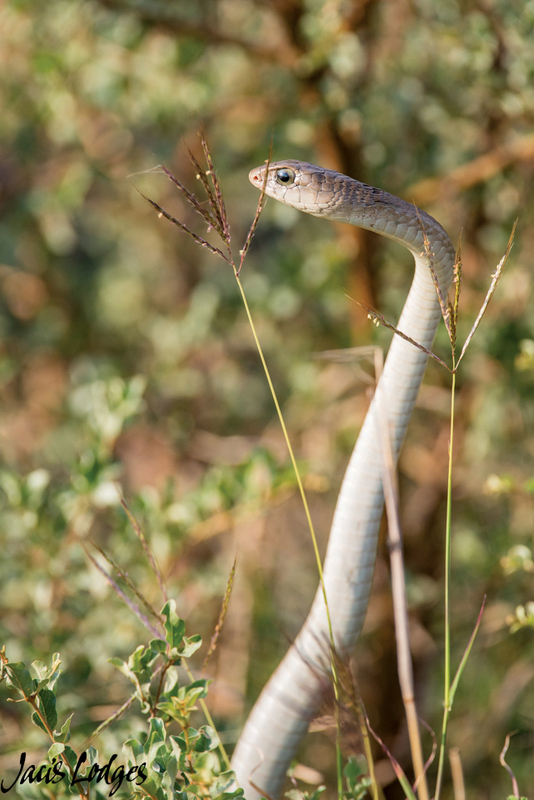 We found a juvenile Boomslang, as well as a male Ostrich on the southern plains and with less than an hour’s light left, we made our way to the cheetah. We weren’t disappointed with the photos we managed to get, as the Cheetah males got moving and we had the opportunity to get photos from several different angles. On our way back to the lodge, we found 2 Buffalo bulls as well. The next morning, we woke to the sun shining, but as we got out at 5 am, we noticed some menacing clouds heading our way. I knew we’d only have about an hour of decent light, before the clouds stole it all again. Our plan was to find Hippo on the Marico River, in the north eastern part of the reserve. 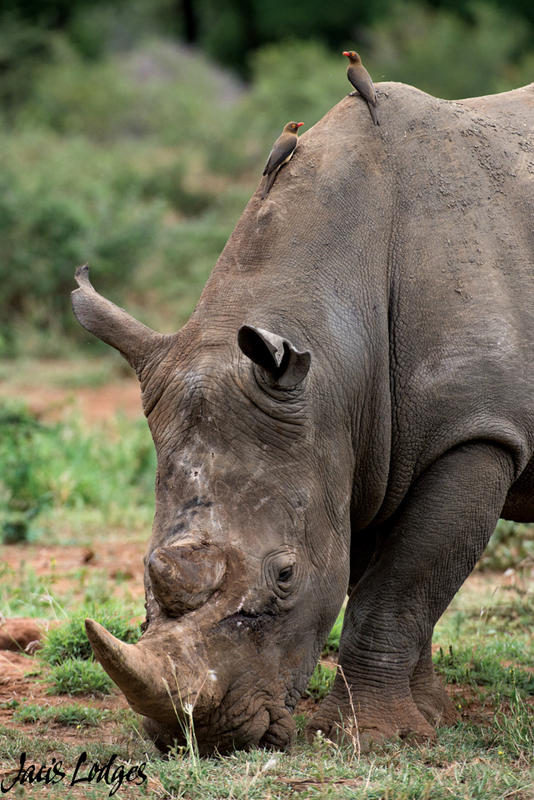 On our way we found some White Rhino, a herd of Buffalo and some good general game, but no Hippo. 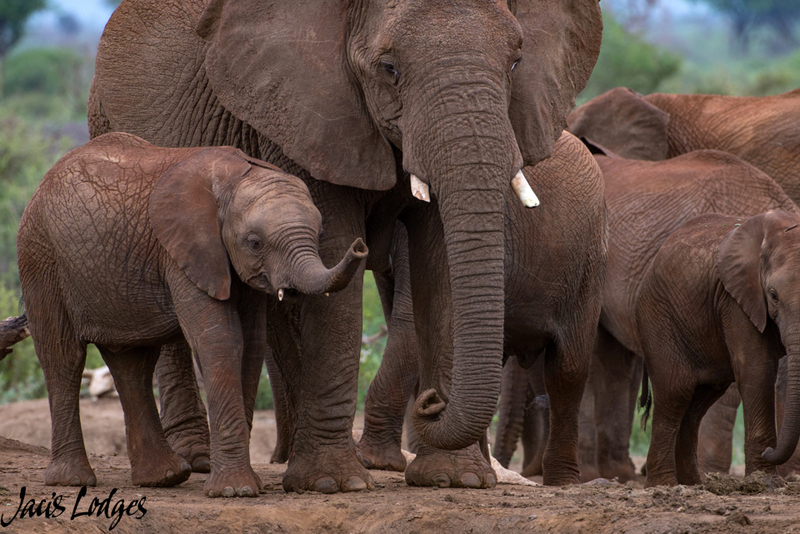 We also had several Elephant herd sightings throughout the morning. 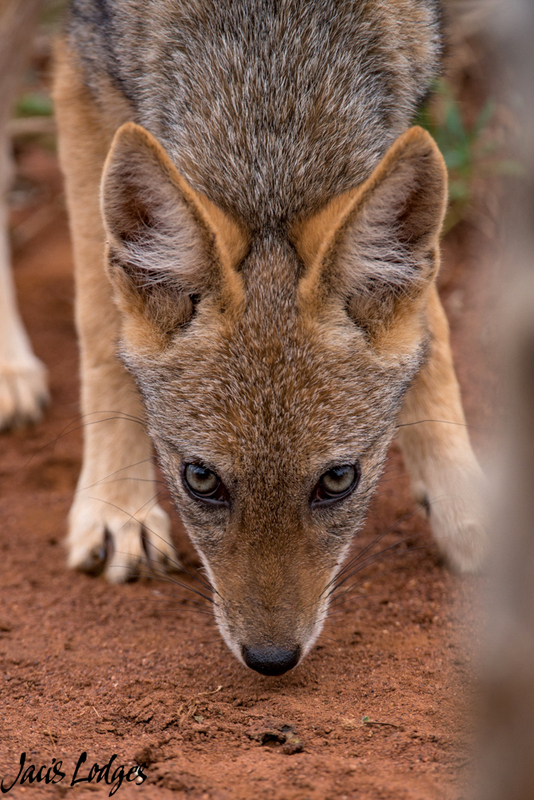 Probably the highlight of the morning was a group of Black-backed Jackals with several puppies. The pups entertained us for a good while, edging closer to us all the time, as their curiosity got the better of them. 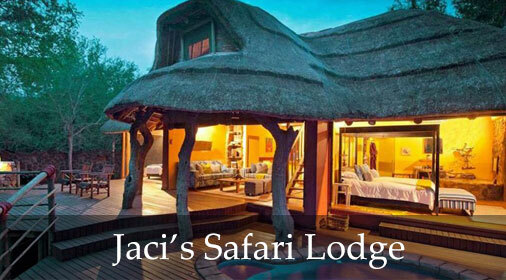 I then heard about a Lion kill in the north, and decided that this would be the plan for the afternoon. 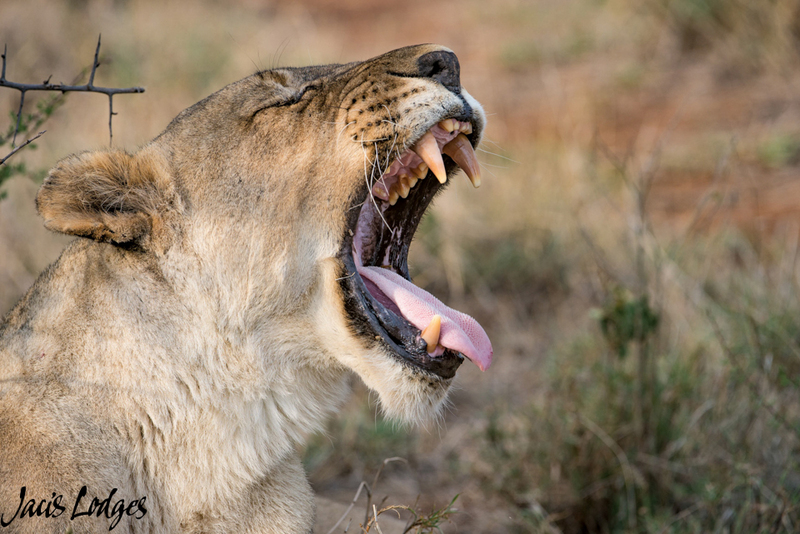 We only had one objective for the afternoon, and that was the Lions with a Giraffe calf kill in the north. We slowly made our way to the area, meandering past Elephants, Rhino’s and plenty of general game including some Red Hartebeest. When we got to the sighting, the male was lying to the side with the 3 females feeding on the carcass. A few minutes into the sighting, and the male made his move for a second helping. 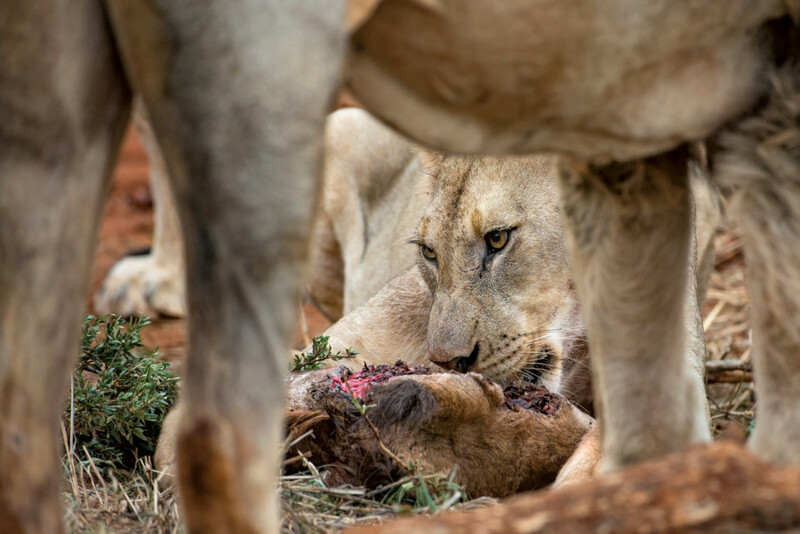 He secured one side of the carcass, while the 3 Lionesses were left squabbling over the other half. We managed a few good shots, before leaving the sighting and making our way back to camp. The guests decided to sleep in their last morning, so this would be our final sighting. We definitely left it on a high.